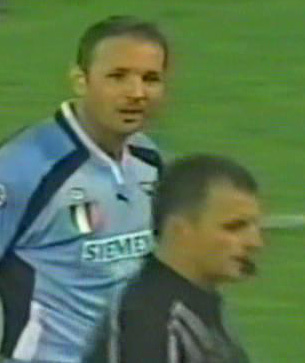 The Bomber of Borovo in action: Sinisa Mihajlovic and S.S. Lazio photos. 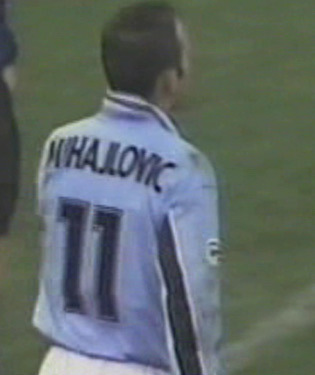 Mihajlovic's winning spirit helped fire the team to victory. He also contributed 6 goals to the championship campaign. Many of these came from his trademark wicked free kicks. His penalty kicks were also awesome for power and accuracy. Lazio 2000 photos on celebrazio.net: Goal and Champion celebrations; shots of Czech Pavel Nedved; captain Alessandro Nesta; focus on the Lazio Forwards; focus on the Defense; close-up on the Midfielders; the "Bomber of Borovo" Sinisa Mihajlovic; assorted Lazio in Action; Chilean team leading scorer Marcelo Salas; others of Coaches and Extras; Argentina's Juan Sebastian Veron; and players wearing the Scudetto. 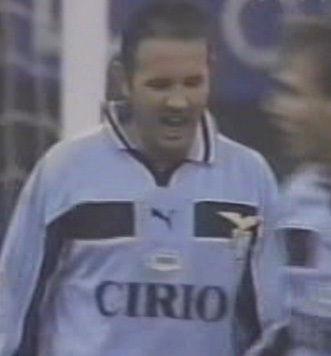 Attacking up the left wing, the left-footed Mihajlovic was a tremendous asset to Lazio. Mihajlovic lines one up against Roma. He finished his career with over 25 goals from free kicks, one of the best records ever. He was also renowned for the range on his kicks, having scored from over 30 meters many times. Celebrating after another free kick goal. His fiery temper fuels the team. Mihajlovic's trademark: the right hand in the air for the left-footed shot. 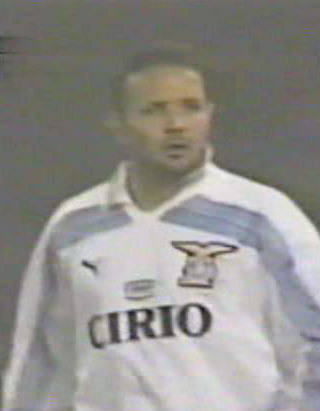 Mihajlovic won the European Cup years before his Lazio career. 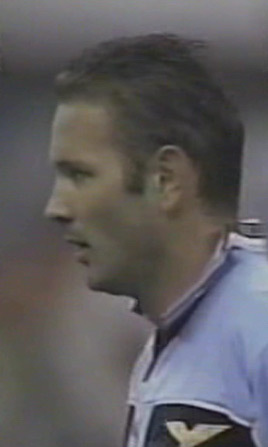 In the 1991 final, Mihajlovic's Red Star Belgrade defeated Olympique Marseille. The match went to penalties, of which Mihajlovic was one of the scorers.